Congrats to the winner of the J. Crew gift card, Sharon B. My last post was about healthy food prep, so why not a giveaway from my favorite food store, Whole Foods Market! 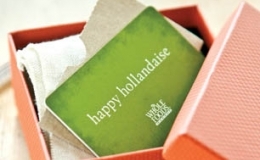 Enter every day for the next week to win this gift card and make shopping happier! Happy Friday! P.S., I'm graduating from college TOMORROW! I LOVE to get sushi from Whole foods! Or their salad bar! I'm obsessed with Whole Foods and I love my berries! Thank you so much for offering such a generous giveaway. My favorite food is honey glazed salmon with roasted pecans. My favorite food is fish sandwich, thank you. I love whole foods prepped foods, especially their guac! I would have to say macaroni and cheese..or really any pasta...with cheese...pasta is my weakness! Am I allowed to say chocolate? If not it would be spaghetti bolognese. My favorite food is fresh organic corn on the cob! I love Chinese food. Thank you for the chance to win! I love Mexican food. Or more specifically, New Mexican food.